Album covers, song lists, and information on rare Beatles CDs, demos, unreleased songs, concerts, and solo recordings. Offers a trade list. Reference guide to Beatles and solo sessions of other groups where the members of the Beatles assisted in some manner. The Beatles songs in MIDI and .wav formats, and a small collection of links to Beatles related sites. Information on Israeli released Beatles albums, singles, and other items. Essay on The Beatles in Israel. Scans of Hebrew-language articles and news clippings. A walking tour of Beatles sights in the city, as featured on the Beatlemania Britain TV show. Details of Guide to the Beatles London book. The Beatles Story in Comics. Art about The Beatles: design, painting, sculpture, cyberart. The Beatles are to launch their first official Web site, more than 30 years after the group split up. A review of 'The Beatles Anthology: Volume 2' by Mark Hertsgaard. Lyrics to over 200 Beatles songs and a forum for fans to chat. Scott Floman provides ratings and analysis of The Beatles albums. Biographies and photos of the Beatles and each band member. Photographs, articles, trivia, MIDIs, and links to other Beatles sites. Small webring for any type of Beatles related sites. A fan shares pictures and personal thoughts about The Beatles. English and Japanese. Listen to Beatles songs and read their lyrics. Also news, a chat room, and trivia. Large collection of wallpapers featuring the Beatles as a group and as individual members. Includes a small list of Beatles bootleg sites and signup information. Quotes, soundtrack information, and short summary of the plots from The Beatles five movies. Former Quarryman Ken Browns web site, featuring his book 'Some Other Guy'. trading beatles cd-rs. updated daily. A site dedicated to finding Beatles references in songs, movies, and TV shows. Lyrics to Beatles songs organized by album titles. MIDI karaoke provided. Facts and trivia, as well as links to articles covering Beatles history, discussion, and analysis. MIDIs and lyrics, biographies, discography, news, filmography, memorials, and other Beatles facts. Four musicians playing songs from all stages of The Beatles career. Photographs, news, MP3s, and information. Essays written by a fan of the Beatles on all the aspects of Beatlemania. A fan community includes articles, upcoming events, forum, news, discography, Beatles festivals, links, and other information. The Beatles story, 1963 to the break up and through the solo years, told through interviews and quotes with photos and animations. A collation of information with an Aussie perspective of the Beatles and their music. Includes photos and details or releases, comments and links. the original drummer for the silver beatles and the beatles. includes a photographs of the artist, timeline, discography, guestbook and message board. The Beatles receive the 'Presidents Award' during the 2004 Grammys. Press release with quotes. Information on the 'Breakfast with The Beatles' radio program on 99.5 FM in Colorado. Also discographies, references, voice/audio clips, news, and photographs. Message board with various topics on the members of the Beatles, as a group and solo artists, including Pete Best. If the business hours of Rare Beatles in may vary on holidays like Valentine’s Day, Washington’s Birthday, St. Patrick’s Day, Easter, Easter eve and Mother’s day. We display standard opening hours and price ranges in our profile site. 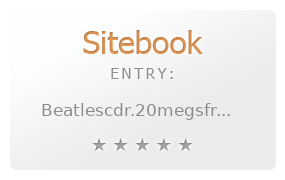 We recommend to check out beatlescdr.20megsfree.com/beatles.htm for further information. You can also search for Alternatives for beatlescdr.20megsfree.com/beatles.htm on our Review Site Sitebook.org All trademarks are the property of their respective owners. If we should delete this entry, please send us a short E-Mail.